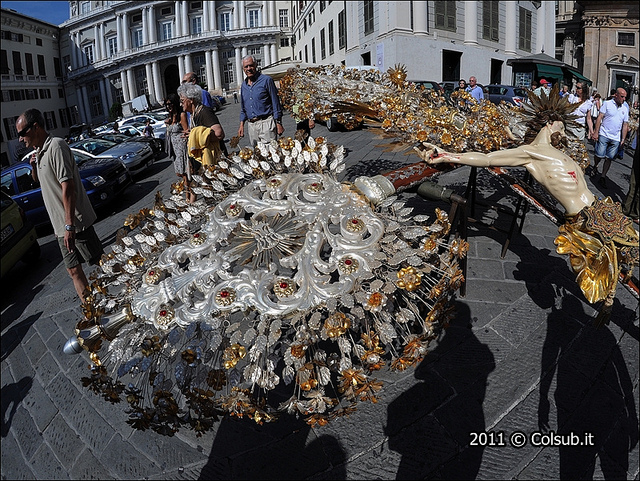 From the first days of spring until November there are more than 200 religious processions in Genoa. 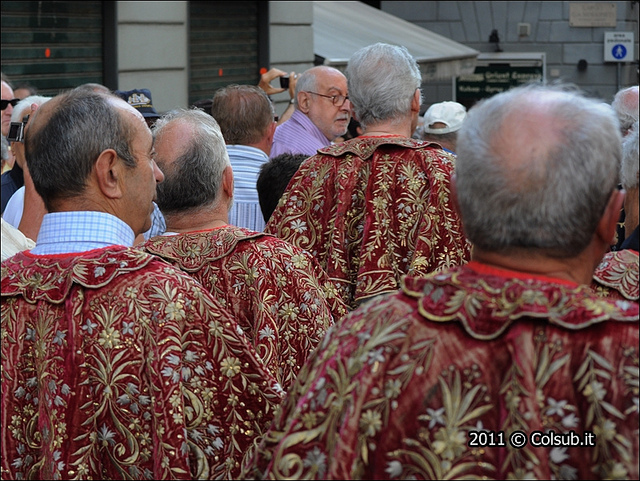 They are called ”processioni delle Casacce”, Genoese word that indicates the many Confraternities present on the territory, there are 180 of them in the archdiocese of Genoa. 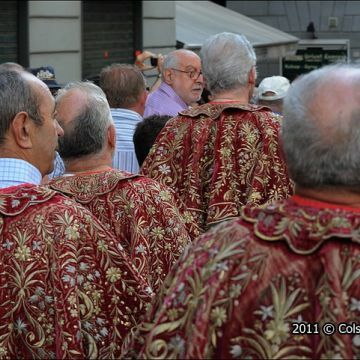 Among the most famous processions of the city, there is the one held on Saint Thursday night that runs along the small alleys, enlightened by the candles of the participants and stops in front of the seven most ancient churches of the medieval part of Genoa to visit the famous sepulchres. 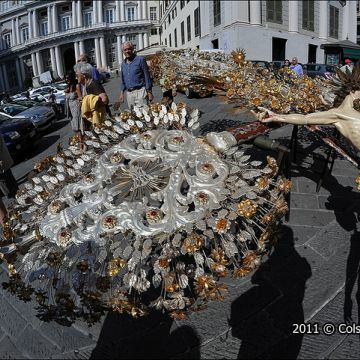 On June 24th, San Giovanni Battista day, the entire afternoon is animated by the great procession that leaves from the Cathedral to reach the Porto Antico, in which the historic Confraternities take part with magnificent costumes and great Baroque cruciefied Christs. During the summer, in August every Sunday from the Assunta celebrations on August 15th, many traditional West Confraternities go on pilgrimage to the Nostra Signora dell’Acquasanta sanctuary. The brothers reach the sanctuary on foot, while carrying by hand their great and heavy Baroque crucified Christs and the artistic processional cases on the famous “Holy Stairs”. Instead on August 29th, the Confraternities go on pilgrimage to the Nostra Signora della Guardia Sanctuary for the celebrations of the Holy Mother, protector of the city of Genoa. Today the word “Casaccia” became a synonym of "Confraternity”, but it was born to indicate the reunion points of these congregations: they were humble locations, such as baracks or wooden houses. Confraternities are formed by people reunited in religious secular associations with a spiritual and charitable aim. They date back to the medieval era and today we can find them in oratories and churches. 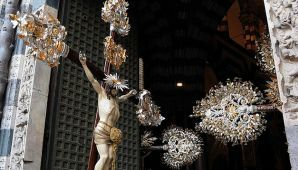 The Cristi are objects of great value, these are great crucified Christs carried during processions with gilded canti which decorate the extremities. Each one of them is more than 100 kilos heavy; and many are more than 120 or 160 kilos heavy. The most precious Cristi date back to the 15th century and remain guarded in oratories. There are more than 500 Cristi owned by Genoese Confraternities, many were created by the Rungoldiers, a dinasty of specialised sculptors from Trento; there are also the ones realized by A. M. Maragliano; and the famous Cristo nero sculpted by Bissoni in 1610 in jujube wood.